Every now and then I visit somewhere in the course of my travels that is so far removed from anything I’ve seen before that I cant help but feel that I’ve only scratched the surface in my endeavors to “see the world”. 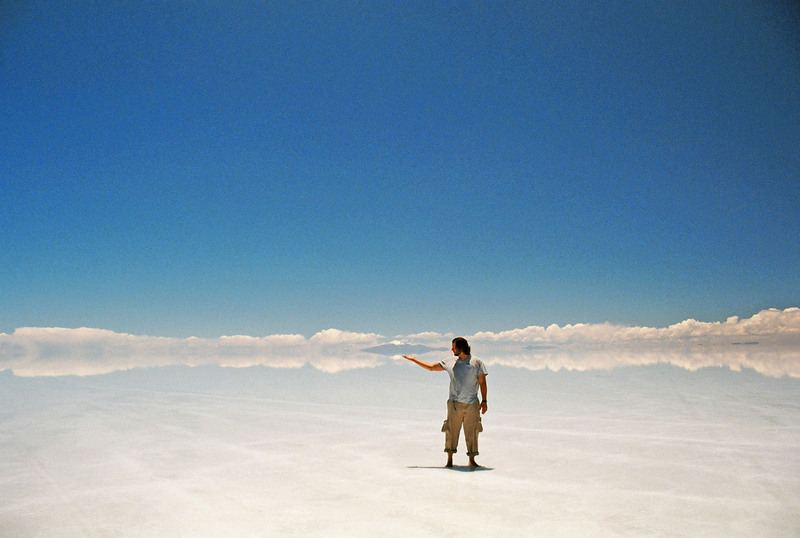 Bolivia's Salar de Uyuni falls into this category of unique places. One of the most peculiar geological anomalies I’ve yet witnessed greeted me after a long off-road overland trip though the high altitudes of the Andres Mountains into Bolivia from Chile . The Salar de Uyuni is the world’s largest salt flat, with 12,000 square kilometers of white salt covered by a layer of water only a few inches deep. It is this thin cover of water that imparts a fantastically unreal look to the salt flat. The water layer has the effect of creating a giant white mirror as far as you look. The bizarre effect of this quirky mirror is that your sense of perspective and depth perception is distorted. This effect is created because as the clouds that ring the Salar de Uyuni reflect into the giant expanse of salt and water there is no horizon but rather just a blur of clouds looking up and down. It’s as if all at once you are looking up at the heavens, down at the heavens, and simultaneously standing in the heavens. Snow capped peaks in the periphery seem to hover in the air. Looking in the distance landcruisers driving on the slushy waters of the salt flat seem as if they too were floating in a vast expanse nothingness. Salt mining trucks and equipment look as if they are driving on water. To be sure the visual effects are absolutely bizarre and gravity and simple laws of optics seem turned upside-down. A person standing off in the distance doesn’t look like they are off in the distance, rather they look like a miniature person because of the distortion in perspective. I happily snapped away pictures marveling at the circus of optical illusions. I ended up in Bolivia after leaving on a 4 day overland trip starting from the equally spectacular Atacama desert of Northern Chile . The landcruiser trip through the Andes was spectacular to say the least. Once we left the small village of San Pedro in Chile we drove along a paved road for a short time past a snow capped volcano until we got near the Bolivian border. Then it was off-roading on dirt paths with a few other backpackers and a driver for 4 days. There was a small outpost that served as the Bolivia-Chile border checkpoint and after completing some paperwork it was off further into the Andes . The unpaved path though the lunar like valleys and elevated passes was unbelievable. There were more 16,500 foot passes, colorful red cliffs, jagged rock formations and beautiful canons carved by the winds over the eons. We drove past all manner of lakes, one called Lago Colorado was actually red from mineral deposits. Another lake was an amazing shade of turquoise and another lake appeared to be an emerald color. We spotted the occasional vicuna in the mountains and traversed the occasional llama pastures in the lower valleys with unbelievably green grass owing to nearby streams. Eventually we ended up in the city of Uyuni which we would use as a base for exploring the Salt flats and later the “train graveyard” just outside the town. The town is a small but interesting destination tucked away in the middle of nowhere in southern Bolivia . There is a small market through the center street of the main town where dust and wind sweep through as bands of stray dogs roam scavenging for food. 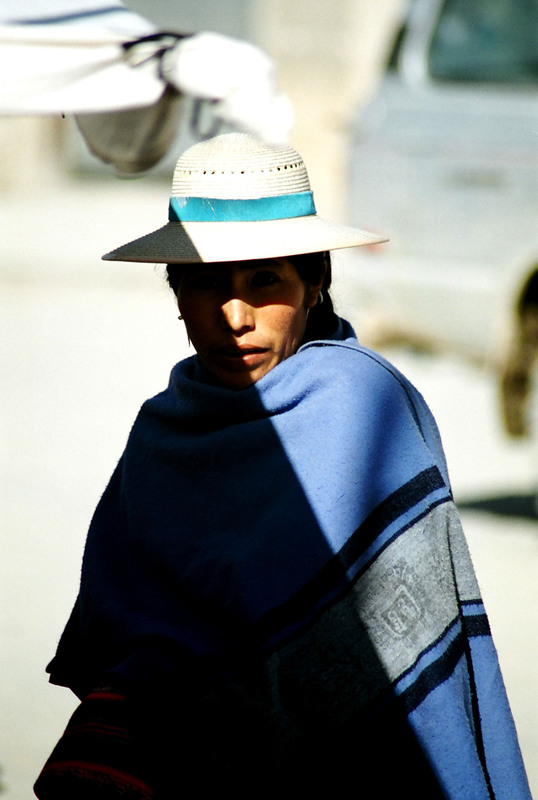 Indigenous women with bowler type hats and long jet black braided pony tails carry babies wrapped in colorful shawls somehow strapped across the chest like a large purse. We were to leave Uyuni the next day for the salt flats but we nearly got stuck in the town. Apparently the town was unhappy with the mayor and a strike was to start the next day with all roads in and out of the city being blocked, fortunately the strike was averted when the mayor resigned, ah nothing like a little civil unrest. 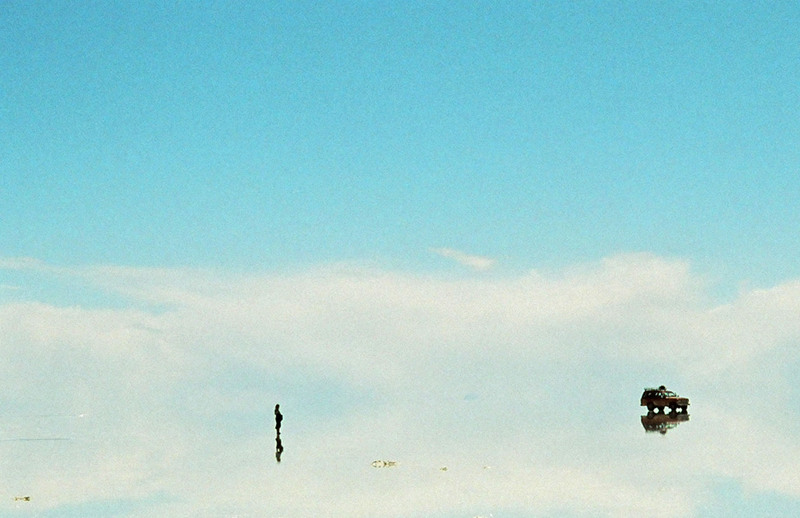 Perhaps the most interesting part of the town of Uyuni was the “train graveyard”. Just outside the town, past an outdoor dump littered with the small town’s accumulated waste, is a train graveyard where the rusting hulks of giant steam powered locomotives rest for eternity. There were perhaps 50 of the trains sitting in the silent desolation of the windy plain. The rusting brown behemoths are remarkable and it was interesting to ponder what trains were like a century ago. The driver didn’t really do a good job of explaining how they got there but he said they were more than 100 years old. 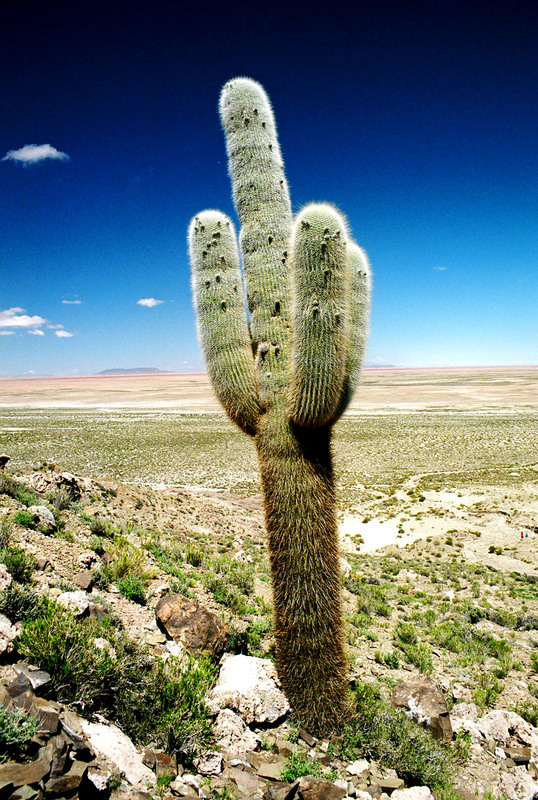 Further outside the city under a striking blue sky sits a plain with red and orange painted mountains and giant cactuses. I felt like I was in a road runner cartoon. I went and climbed a few hills and took some pictures of the cactuses and other vegetation. Eventually after visiting the salt flats and the train graveyard we left back to Chile taking the same path that we had arrived on to return. The return was an interesting if a bit tenuous journey. We headed back into the array of beautifully colored Andean peaks early in the morning. The Canadians that I rode back to Chile with were hilarious and started drinking a very cheap and uniquely unpleasant tasting Bolivian hard liquor promptly at 7AM in the morning as we left the town of Uyuni . The Canadians were quite gregarious and made good company on the long journey back to Chile . Every now and then lush vegetation would pop out of nowhere but mostly it was a vast collection of peaks, valleys, rocks and dirt. The barren unpaved road felt like we were driving on mars at times. Toward the afternoon of the first day driving back to Chile the snow started and the reds and oranges of the mountains turned into a vast blanket of while. At first a light drizzle of flakes floated down but this eventually turned into a heavy snow and then covered the landscape of the entire journey back right before our eyes. As we drove visibility was at a minimum and the temperature plummeted and the snow fell furiously. The dirt path was difficult enough to see when the driver could see the road and then it disappeared under a blanket of snow. Were it not for a path cut in the snow before us by other landcruisers I I don’t know how we would have found our way back. A couple times the landcruiser stalled and the driver opened the hood and fixed something and we were off again. I would have hated to get stuck in a snowstorm in the middle of the Andres. We drove on and on and eventually came to an eerie red lake in the middle of nowhere with a small guest house where we stayed the night. This was the one of the few houses or any habitable structure for that matter between the 2 days from Uyuni to the Chilean border we saw. Eventually the spectacular red lake disappeared below a massive white plain of snow. That night was cold, very cold and I donned all the clothes I had in my backpack in layers in an effort to stay warm. It was chilly but me and the Canadians stayed up late joking around chatting with our flashlights on. The next morning when we were to head back but we didn’t know if we would actually be able to leave or if we would be stuck for the next few days. Our driver was fairly concerned that because of the snow and ice he wouldn’t be able to drive up a treacherous pass of 16,500 feet on the way back to Chile . The landcruiser took off and trudged somehow through a few feet of snow without stopping and eventually we made it over the pass. The scenery was just as breathtaking covered with snow as it had been without snow when we passed by the first time. We eventually came to a field of geysers billowing huge columns of steam into the crisp snowy air. Later we came to a small emerald green lake that was now covered with snow and ice somehow blanketed below a layer of fog. The vistas were amazing but by the fourth day my head was pounding from mild altitude sickness, I was ready to get back to the lower altitudes. Finally I crossed the border back into Chile made it back to San Pedro de Atacama and bid the Canadians and the driver farewell. We were told that all other trips back into Uyuni had been canceled because of the snow, I was glad I took the trip before they were canceled. San Pedro was scenic in its own right and before I left for Bolivia I had hung out in San Pedro for a few days. The town is a tiny congregation of earthy brown adobe houses and dirt roads with a beautiful whitewashed church and a diminutive town square. The town serves as a starting point for people venturing into Bolivia or wanting to explore the surrounding Atacama Desert . 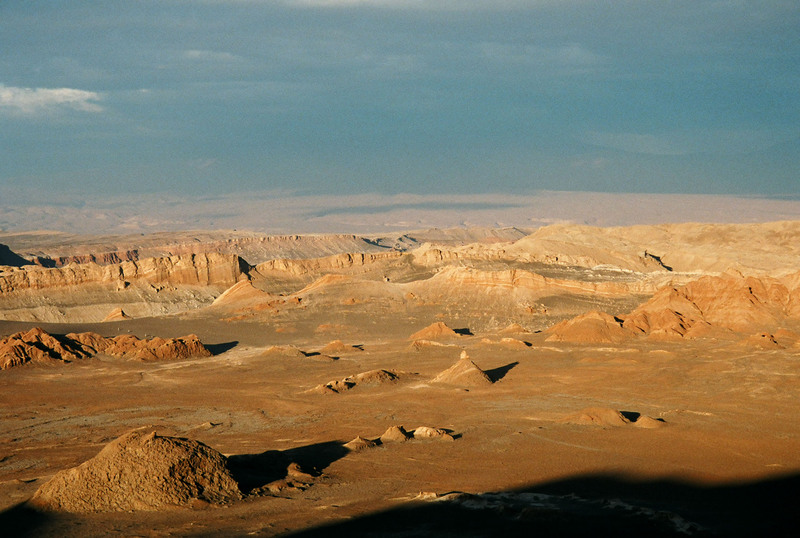 The Atacama Desert is one of the driest deserts on earth. Some parts of the desert haven’t recorded any rainfall in 40 years. San Pedro is a bit of an oasis though, owing to nearby springs. The peculiar vistas around San Pedro are striking. The vast abyss of sand and parched desert surrounding San Pedro seemed an endless plain just waiting to be explored. There is no vegetation in most parts surrounding San Pedro so the desiccated landscapes have an alien feel, especially the “valley of the moon” where astounding rock formations lend a beautiful backdrop to brilliant sunsets. I climbed to the top of a colossal sand dune perhaps 10 stories tall, from below the silhouettes of a trail of tourists on top of the dune looked like tiny ants summiting a massive ant pile. Nearby were odd rock formations stacked like a toppled pile of dominos end on end. The winds blow hard in this part of the land as the odd bird struggles to fly in the air above. Around the desert are more salt flats less remarkable than the Bolivian ones but interesting for the fact that they are inhabited by populations of pink flamencos. I had originally planned to take a fairly cheap bus back to Santiago when I left San Pedro. As it turned out,however, the same weather front that nearly stranded me in the Andres had wreaked havoc around San Pedro. San Pedro is a dry place and the locals say it may rain only for a total of an hour during the whole year. While I was in Bolivia it had apparently rained for an entire day around San Pedro with the deluge causing floods and giant mudslides that destroyed parts of the only road back to Santiago . I was able to go as far as a small industrial town called Calama about hour away by bus but the road would go no further. The city was basically an unremarkable manufacturing town and nothing to look at really, especially at 1 am in the morning. I looked at a few hostels listed in my book but they were all booked out for the night and after realizing that no buses would go back to Santiago and there was no clear time frame for fixing the road (“could be days to weeks” I was told) I decided to head to the local airport, which amounted to a small airstrip and a small terminal. I took a cab at 2AM in the morning to the deserted airport hoping to take an early flight out. The driver dropped me off and the terminal was of course closed, but I knocked on the glass as it was cold outside and a security guard let me in. I emptied the contents of my bag on the concrete floor which made for some padding and tried to sleep. Eventually woke up and was able to catch a convenient but plane back to Santiago . Once back in Santiago I took a bus to the thriving beach town of Vina del Mar about two hours away by bus. Vina del Mar turned out to be quite the change of pace compared to the relative desolation of the Andes and the dryness of the Atacama desert . Vina is a bustling beach town with beautiful lively beaches where cool pacific waves crash onto the yellow sands of the crowded Chilean beach. The city bustles at night with a large casino, endless bars, the endless neon lights shining from clubs, and loud music. Not far from Vina del Mar is the unforgettable city of Valparaiso , certainly one of the most charming places I’ve visited in South America . Situated on an unassuming hill overlooking the beach the upper town beckons the visitor with its sleepy cobble stoned neighborhoods and houses painted all manner of pastels. Small restaurants with colorful potted flowers and charismatic art galleries intermix with shady courtyards and small cathedrals that give the neighborhood its unconventional charm. Valparaiso , not to be outdone by Vina del mar , also has a vibrant night scene and unique bars and other venues abound. 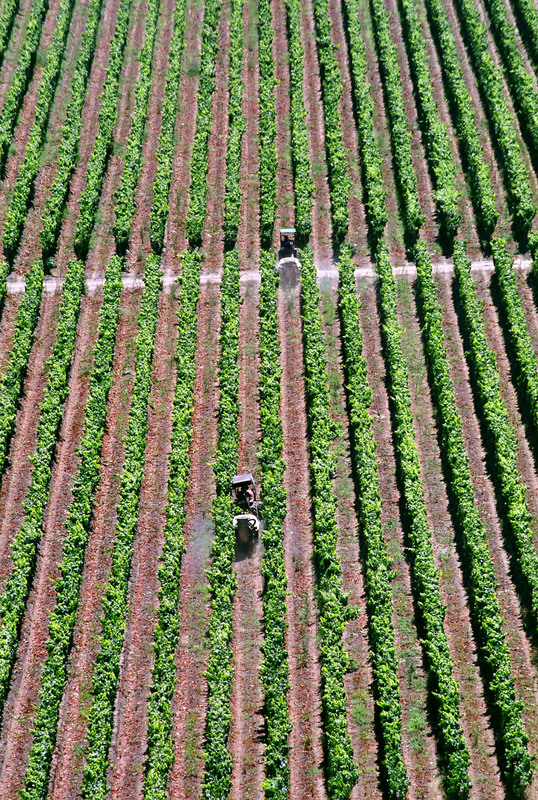 Chile is known for its wine of course and no trip to Chile would be complete without a trip to a few Vineyards. I took a bus from Vina del Mar to a few vineyards midway between Vina de Mar and Santiago . The vineyards were scenic with row after row of green and purple grapes basking in the bright valley under a blue sky. The vineyard houses were quite friendly and it was fun to spend an afternoon wine tasting.